Rihanna's has been live-tweeting the entire World Cup, but last night she got the treat of a lifetime, a place in the stands for the World Cup final in Rio De Janeiro between Germany and Argentina. Then she spent the night partying with the Germans and took us all out with her. 1. 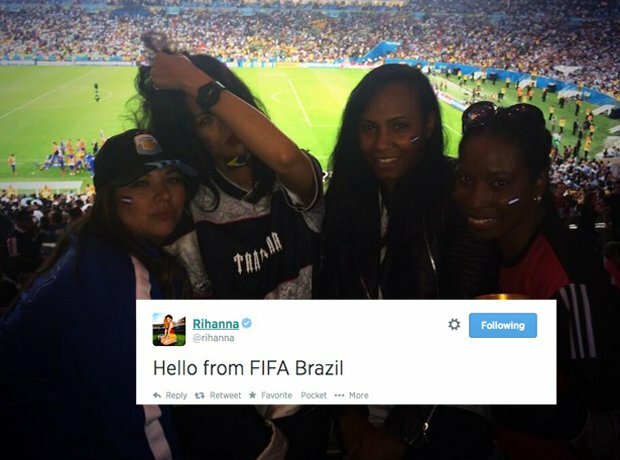 After weeks of live-tweeting every game from home, Rihanna went to Rio in person for the final. 4. In fact, Rihanna spent a lot of the game taking pictures with people, like supermodel Adriana Lima. 6. It was like the best moment of her life. 8. She went out afterwards and met King Klose and, of wait, that's the World Cup in her hands. 10. And the celebrations went on all night in Rio De Janerio. It was a BIG ONE. 11. And the World Cup goes to... Rihanna.